There’s a somewhat unwritten rule pertaining to fog at the Golden Gate Bridge that low fog never occurs two days in a row. Well, never say ”never”! Almost every day for a week I woke up at 5am to check the fog and either go back to bed or drive up to San Francisco. This particular morning was the second one in a row that I hopped in the car and met Alan in San Francisco. 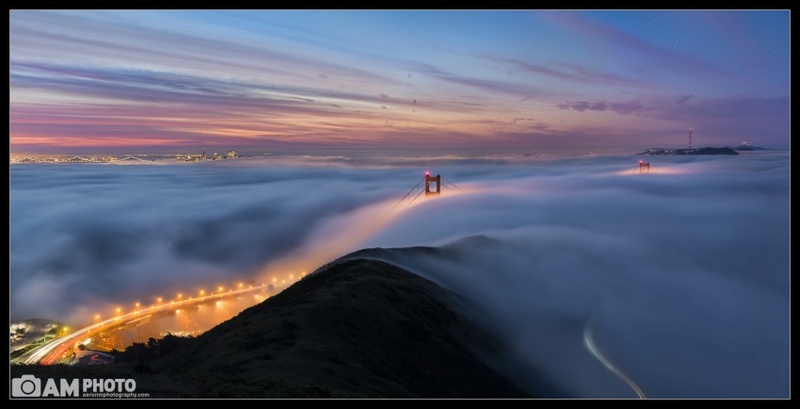 The previous morning I witnessed a much lower fog from Hawk Hill. On this morning, by the time I crossed the bridge, Alan had already warned me that the fog was both a bit high and also really nice. I parked my car, still immersed in fog, threw on a number of layers of warm clothes, and began the huff up the half mile hike to the top of Slacker Hill. It was interesting to watch the fog disappear and the temperature rise about 15° as I walked. Off came the layers. The fog rose and fell slightly as the sun rose but it stayed near the tops of the two Golden Gate Bridge towers. It was slightly higher than I would have liked but the clouds in the sky kept my hopes up for a beautiful morning. Sure enough, Mama Nature did not disappoint. At twilight the clouds began to glow pink and orange and as the sun got higher in the sky the clouds bursted with pink and red color. I came home with so many photos I was happy with that I didn’t even know where to begin! I chose this photo from earlier in the morning because of a couple of reasons: First, the glow in the fog was still fairly prominent. This was also about as low as the fog got and you can get a bigger glimpse of the two bridge towers and the city hiding in the background. Some color had started streaking into the sky but a couple of stars can still be seen in the upper right. A car and a biker made their way up Conzelman Rd as my shutter remained open for this 20 second exposure. It was a beautiful morning spent with Joe Azure, Jim Patterson, Alan Chan, Jared Ropelato, John Harrison and a number of other photographers. The saddest part of the morning was having to pack up early and head to my 9am meeting in the South Bay (I managed to get to the meeting at 9:02am! ).